The Group Travel Video app makes it possible for groups to upload and share all their photos in one place and will walk away with a DVD copy of their memories. David Martinson, president and CEO of PhotoVision Inc., comes from a long line of photographers, starting with his grandfather, who took slides. Nowadays, of course, pictures are taken in a totally different way. “Today, people take 500 pictures of their kids’ baseball game that they never end up looking at” said Martinson. “Pictures are also being lost, such as when computers crash, because people aren’t keeping photos in print form anymore.” His solution: the Group Travel Video app. The app allows members of any size group to upload and share their photos in one place. After all the pictures are uploaded, the app compiles all of your photo memories into DVDs for all of your travelers. This DVD collection, like a plastic-bound photo album, gives your group the opportunity to keep photos from your trip all in one place that they can watch anytime they please. PhotoVision was created in 1997. Since then, the company has produced over 700,000 videos. The company manages images—whether they are old 8mm home movies, pictures, slides or digital images you took yesterday—then transfers your pictures into a stable media that is easy to keep and view. When PhotoVision started creating videos, it would send out the old Kodak single film cameras with travel groups who took pictures and sent the cameras back to make the group’s video. As technology advanced, the company started to send digital cameras with travel groups. In May 2012, Martinson traveled to Washington, D.C., where he noticed almost everyone taking pictures with their mobile device. This sparked the idea for the Group Travel Video app, which was launched in February 2013. While the company still offers to send digital cameras along with groups on their travels, the app is growing in popularity. “I read a research report saying 50% of all pictures in the U.S. in 2014 will be taken by a smartphone,” said Martinson. After just eight months of launching the app, Group Travel Video received enough feedback to create the new and improved GTV app V 2.0. The app’s features allow groups to access and upload videos on the same account through a unique group username and password; allow family and friends who aren’t traveling with the group to see photos with the same username and password; and allow each traveler to receive a DVD copy of the photo video. V 2.0 has been improved based on customer reviews. It now allows you to show your group’s logo in more places and users can upload up to six photos at once. Members receive notifications that remind them to share photos and to tell them when the video is ready to watch. A new “info” button tells them how much time they have left to share photos and how many more photos the group can upload. If you don’t consider yourself tech-savvy, the improved app features a demo video to explain functionality to travelers. Group Travel Video distributes app cards to the group leader to distribute to its members. One side of the card explains the app and what it does. The other side provides unique QR codes for iOS and Android as well as a username and password specific to your group. If you’re wary of the quality of uploaded photographs or the class clown uploading a “funny” picture, the photo administrator (usually the group leader) has the ability to delete any photos with their special admin login. Also, when a group member uploads a picture, his or her name appears under the photo. 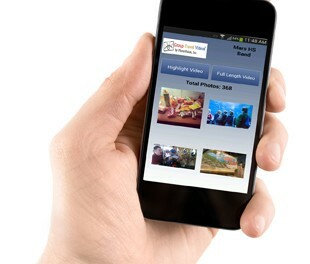 Group Travel Video app V 2.0 allows its users to upload the finished video to Facebook or Twitter once completed. The next version of the Group Travel Video app is expected to debut in 2015 or 2016. As more people use and become familiar with technology, more changes will be made. One of the potential improvements to be added in the next version is to allow travelers to write captions for each uploaded photograph.